It must be my week for books about smart girls. This is the second Ruby Redfort book, and it’s one of those books where I had girls coming in every day asking me ‘Is it here yet? Is it here yet?’, and that doesn’t happen all that often. Well it is here, and if you loved the first book, you will undoubtedly love this one too. 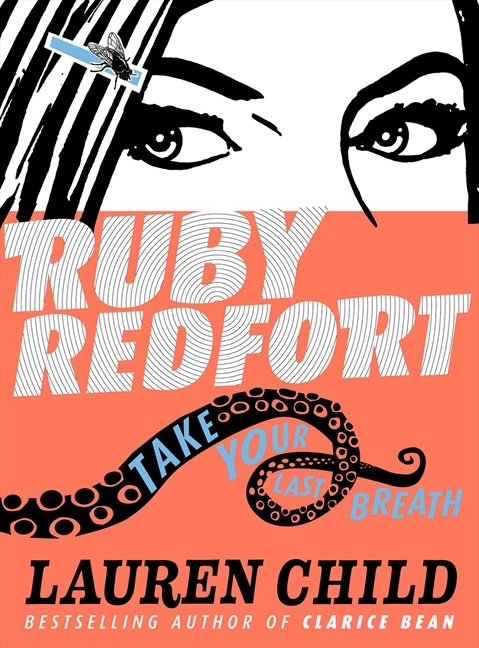 If you are not familiar with Ruby Redfort then I will fill you in. Lauren Child wrote a series of books about a character called Clarice Bean, and in those books Clarice read a series of books about Ruby Redfort. At that time there was no such series, Lauren Child kept getting asked ‘Where can I buy those Ruby Redfort books from?’, and she had to tell people that they were made up, they didn’t exist. Eventually Lauren Child decided that she should write the Ruby Redfort books herself…so she did. Ruby is a super smart code loving 13 year old girl, who has a secret job working as a spy for Spectrum. She spends most of her time alone or with her best friend Clancy or housekeeper… Her parents are extremely wealthy, but are more absent than not, and they have no idea what Ruby gets up to with Spectrum. Because of her skills with codes and code cracking, Ruby and Clancy often communicate in code, some of these are decoded at the back of the book, but others you just have to figure out yourself. In this book one of the codes used is the, Chime Melody musical code, which of course our little code cracker figures out. For us mere mortals there is information at the back of the book as to how Ruby cracked the code. As well as evil villains, pirates and spies, this story also has a ‘creature from the deep’. If the humans aren’t enough trouble, how will they manage to escape the clutches of a GIANT octopus. Ruby has a penchant for wearing some sassy, and at times inappropriate T-Shirts, Some of my favourite T-shirts include: could you repeat that? I wasn’t actually listening and wake me if things get interesting. Ruby also has rules, all of which are numbered, like Rule 12: Adjust your thinking and your chances improve and my favourite, Rule 1: You can never be completely sure what might happen next.